Instead of creating term sets that are available farm wide, it’s also possible to create a term set that is only local to a particular site collection. 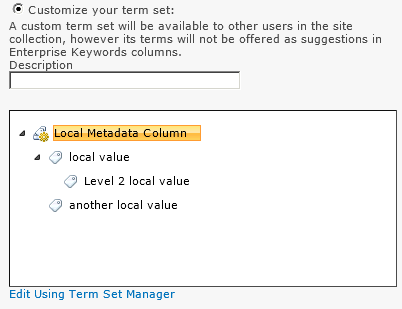 Then simply add terms to the top level node (same name as your column by default) and once your happy click OK to create your metadata column based on a local term set. Central administration provides a way to import metadata term sets and terms by uploading a CSV file. However, it does not provide a mechanism for exporting terms to a CSV. There are quite a lot of PowerShell and command line utilities on the web for accomplishing this, however, the ones that I found did not cater for terms that are more than one level deep. After all, you can create a term hierarchy that is up to seven levels deep. So, to help fill this gap I’ve written a simple PowerShell script that does exactly this. If you’re trying to add a managed metadata column to your site, you may see the text “The required feature is not enabled for this column type” in the Term Set Settings. section. The message is simple enough but does not give you enough information so you can quickly resolve the issue and create a managed metadata column. Well, the feature it requires is the “Register taxonomy site wide field added event receiver” hidden site scoped feature. There appears to be various different recommendations of ways for updating a term store field value and I’d like to chip in with mine. Some recommend updating by setting the list item’s hidden taxonomy field, which looks something like the following.